Around here, grilled cheese sandwiches are more or less a staple come lunch time. 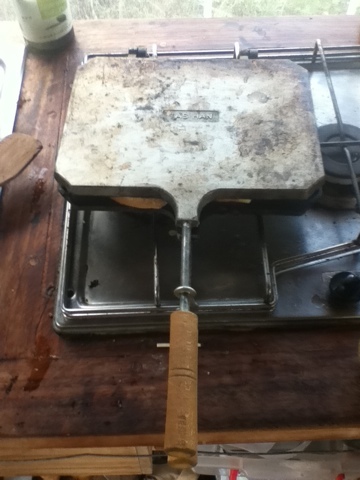 Luckily, tost, the grilled sandwich, is a mighty presence in the culinary lexicon of Turkey, so there exists this magnificent little device- the stove-top sandwich press. Ali and Baki are most fond of the classic karisik (mixed) tost, consisting of sucuk sausage and cheese. I, on the other hand, am purely a grilled cheese and tomato girl. Thanks so much for your kind words and welcome to the blog! I have not always lived here in Turkey, actually. My parents moved here in 1992 (my dad was a journalist) and I spent year here with them. I didn’t move here to stay until 2002, though, and married that year. I love my stove top toast machine and I will feature some other appliances soon. Hope you’ll stop by again!